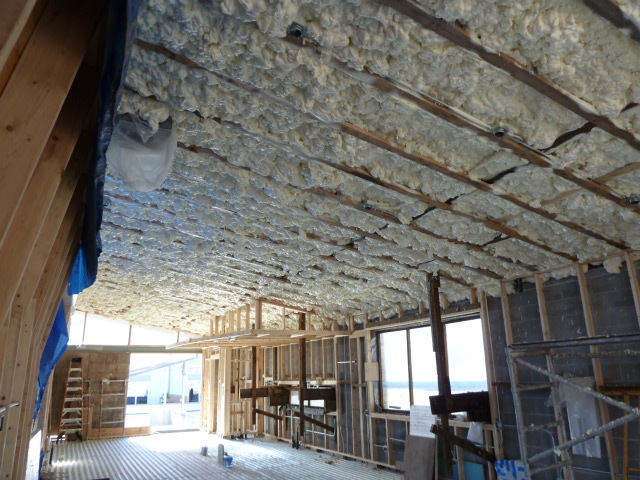 The roof section was insulated last week with Icynene open cell spray foam by Eco-tech. 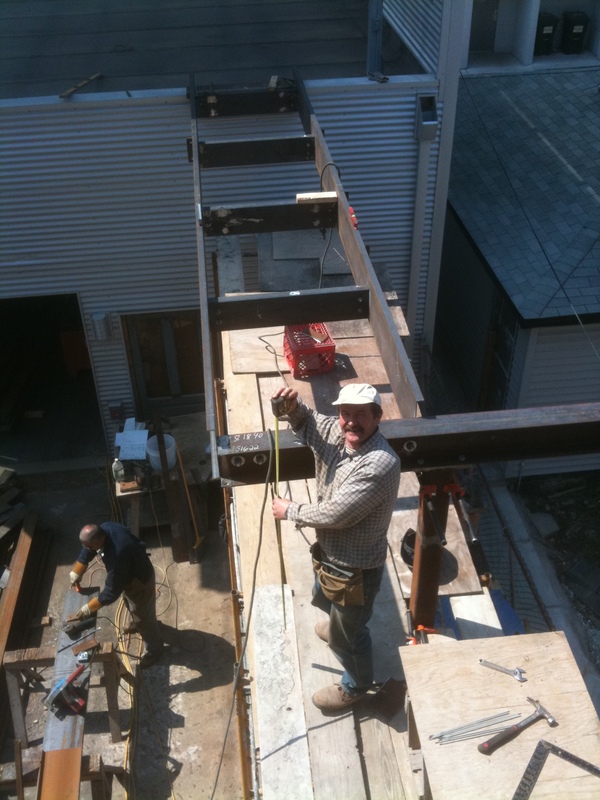 The open web truss measures 16″ and the was sprayed to a minimum of 14″. Icynene open-cell product provides an R-value of 3.6 per inch. In addition to the R-value (heat resistance) the product provides an air seal and is an excellent sound barrier. Basically there are 3 ways heat moves through space- Conduction, Convection and Radiance. Conduction is the transfer of heat through a material- think of heating one end of pipe with a blow-torch. Eventually the other end warms up too. Convection is like how a convection oven works- heat is blown around through the air so food cooks more evenly, and not just from where the burner is. Radiant heat is the sun or a campfire or those heaters on train platforms. Even in windy conditions, the heat continues to radiate from the source to the body. When insulating the house, we are trying to manage all 3, but especially the first 2. 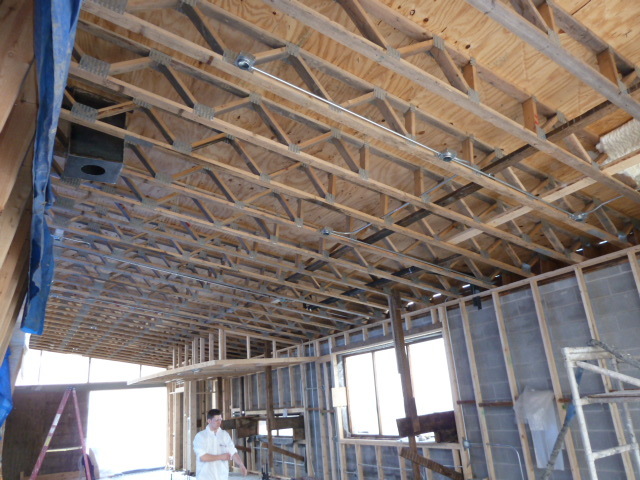 In buildings, convection frequently poses the biggest problem. 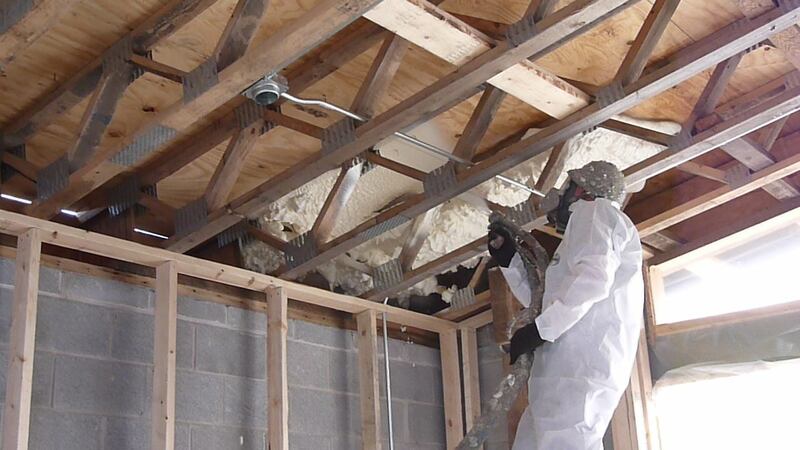 Even in buildings that have thick walls and have high R-value insulation, if walls have gaps and cracks (from windows, doors, plywood joints, and so-on), and air is allowed to move around that good insulation, the house won’t perform well. 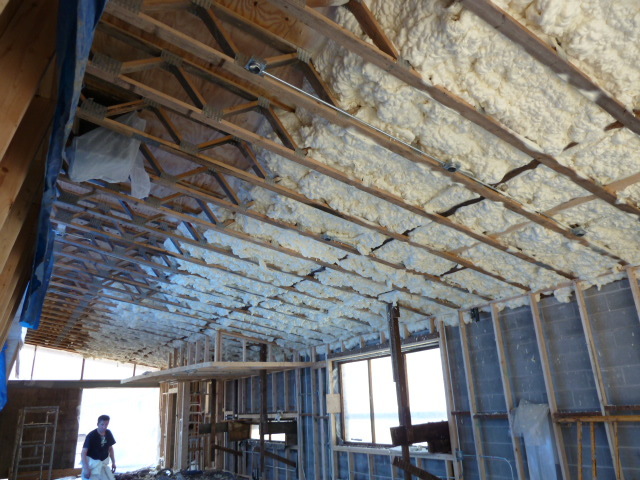 One advantage to spray foam is it has a high resistence (Conduction) and fills those gaps where air can move around (Convection). 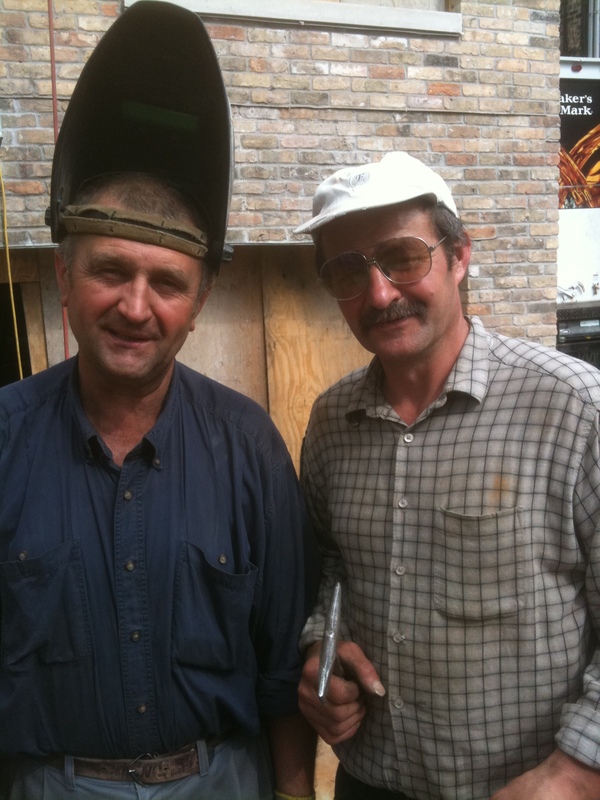 Jerry Lewis (Bogden) and Elvis (Woytek) take a break from their act at the Flamingo to build the bridge from the house to the roof top deck of the garage (which sits under the 40 solar module canopy that has been used during construction, and will eventually power the house). Like the front entrance, the bridge once it is complete, it will be completely disassembled, sent off for galvanization and then brought back for final installation. 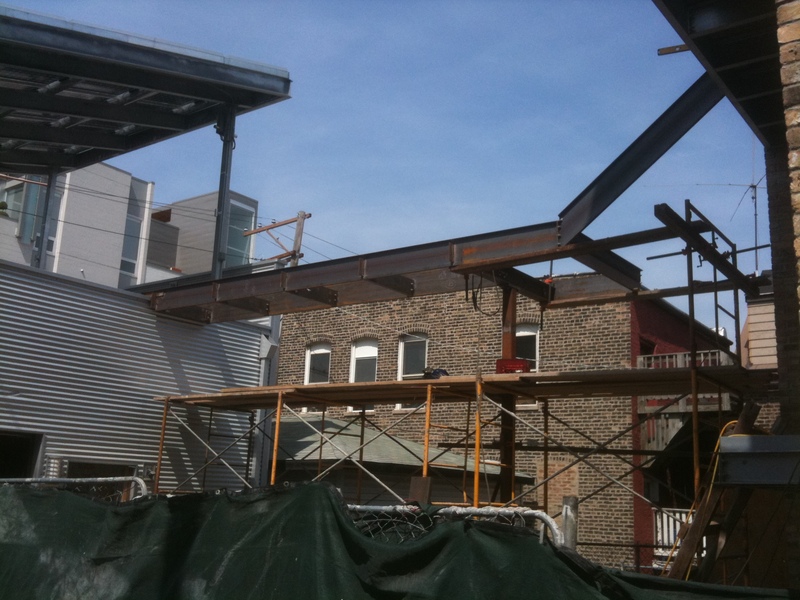 You are currently browsing the Elementalbuilding blog archives for May, 2010.